Looking for Help with an Insurance Claim? Our Florida Public Adjusters will help with your insurance claim settlement. Don’t settle for less than you deserve! As Floirda Public Adjusters our #1 goal is to ensure that you recover the largest settlement available under your insurance policy for you covered insurance claim. Every insurance claim is unique and will be handled as such, however we will typically do everything from filing, compiling and ultimately settling insurance claims. This will often include writing comprehensive damage estimates, inventorying personal property, meeting with and retaining experts when needed, filing all necessary paperwork, documenting your file and meeting with Insurance Company Representatives. Complimentary Insurance Claims consultation with a Florida Public Adjuster! As we all know Hurricanes are one of the worst natural catastrophes that can occur. The mass devastation that is caused by Hurricanes always creates chaos in the claims world. Insurance companies will scramble to get a team of adjuster to the location to handle the high volume of claims, unfortunately, due to the demand there are many inexperienced adjusters working these types of storms. Sinkhole losses have been getting a lot of press lately as they are a recurring natural disaster that is simply caused by the land that we have built on in parts of Florida. Most people have seen photos of houses being swallowed up by the earth, those are sinkholes but by no means common sinkhole problems. Many sinkholes occur beneath the earth and therefore make it impossible to see. Vandalism Claim will leave you with more than a financial loss, they will leave you feeling very violated. The last thing you want is to have to fight with an adjuster about the contents you may have lost or the damage that was caused. Water damage insurance claims can be much more complicated that they appear. There are a minefield of exclusions that can easily result in a complete claim denial if presented improperly to the insurance company. If you have ever returned home to be greeted by water rushing under your door, you very quickly came to appreciate the enormously destructive power of something as simple as a toilet overflow, broken dishwasher hose or burst pipe. Do you know what it will take to get your property back to the pre-loss condition after suffering a water loss? Did the water wick up your walls? That’s right, it can and does soak up into your drywall which can eventually lead to mold growth. Fire damage insurance claims are by all means some of the most complicated claims. There are obvious visible damages, but ash, smoke and water contamination is not simple to diagnose or treat effectively. You have to consider 5-10 years down the road, will the smell reemerge? Are there any contaminants that could be harmful to you and your family? Living in Florida these are some of the most common claims we see. Lightning strikes are tricky claims to adjust and most likely what you can see is not what you got. Electricity has a funny way of breaking stuff! Many of our ‘normal’ storms here in Florida can produce intense winds with rain which can and does often cause damage resulting from water entering the home through windows or roofing leaks. Again, all of the damage is not always seen right away. In the event you suspect that you may have storm or lightning damage to your home give us a call and we will send one of our very experienced adjuster to evaluate your situation and recommend a course of action. Theft and Vandalism losses will leave you with more than a financial loss, they will leave you feeling very violated. The last thing you want is to have to fight with an adjuster about the contents you may have lost or the damage that was caused. Our job at Claim Concepts it to help people like you. Our passion and expertise is to put an accurate dollar value on your loss and relentlessly fight to recover it from your insurance company. We don’t work for the insurance company, we work directly for you with ONLY your interests in mind…let us fight for you! Boat Damage Claims can be very tricky to navigate through. Even if they don’t deny you right away you are going to be facing a claim that you most likely have no idea how to handle. The Policy has many exclusions but it also has many ways to protect you and your property. Typically you would take the boat to a Mechanic and he will meet with the Insurance Company Adjuster, they love that. Mechanics look at simply how can they fix the problem and don’t know or care about the policy. As Public Adjusters we look at the policy and see what you are entitled to and work hand in hand with the mechanics in order to get your boat back to its pre-loss condition. Don’t get pushed around by the insurance company adjusters, we are here to fight for you! Whatever the cause of your claim, contact us today for your free claim evaluation with a Licensed Florida Public Adjuster. All of our fees are based on what we recover from the insurance company, therefore, we don’t get paid until and unless we get the insurance company to pay! 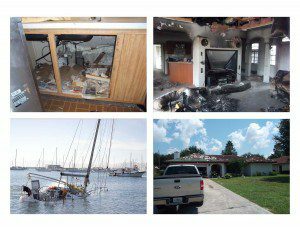 Free Insurance Claims consultation with a Florida Public Adjuster! Call us at 800-801-2099 – 24 hours a day, 7 days a week. We arrive on-scene fast, assess the damage and begin the process of maximum recovery for your insurance claims.